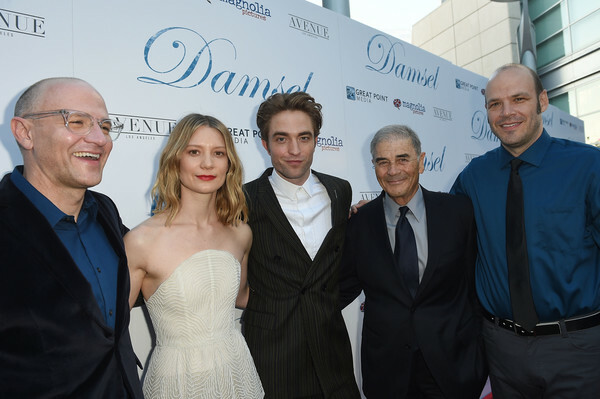 VIPAccessEXCLUSIVE: Robert Pattinson And Mia Wasikowska Will Leave You In Awe (And Laughing Endlessly) In The Zellner Brothers’ Film “Damsel” — RECAP Here! Don’t be fooled, she certainly isn’t your average damsel in distress! In the spectacular film, Damsel, Mia Wasikowska takes on the role of Penelope, a tough cookie who definitely shouldn’t be messed with. However, every guy who comes across her – from an affluent pioneer to even her own brother-in-law – seems to find themselves enamored by her and they think they need to take on the role of her savior and help her from being a “damsel in distress.” But, Penelope isn’t going to let that happen. Damsel, directed by David Zellner and Nathan Zellner, has a perfect blend of comedy, drama, love and action with a great twist on the typical western kind of movie. In the brilliant film, we’re acquainted with Robert Pattinson’s excellent character, Samuel Alabaster, a pioneer who is on a mission to marry the love of his life, Penelope. He brings along with him a parson named Parson Henry to help officiate the wedding. Alabaster then reveals to Parson Henry that he wants everything to go smoothly with the wedding, but (BTW) Parson Henry will also need to help him save Penelope first as she has been kidnapped. Alabaster and Parson Henry make a unique and unusual dynamic duo as they attempt to achieve the goal of getting Samuel Alabaster and Penelope married. But, let’s just say that Penelope didn’t quite have the same idea in mind. The movie continues on with an endless amount of adventure… and a whole lot of laughs! The journey has its own twists and turns that the characters would have never imagined themselves getting into. Many of us have seen a countless amount of films focused on the Old West, but Damsel truly stands out. It keeps an exciting momentum throughout the entire movie and it’s hard not to emphasize how funny this film really is. Most western films are serious and filled with tons of horse-back riding and gun-shooting, however, the Zellner brothers included a great amount of humor in Damsel that makes every moment unforgettable. It’s clear to see that everyone who was a part of this magnificent film had so much passion for the masterpiece they created – from the actors and actresses in the movie, to the directors and crew-members. Robert Pattinson did an exceptional job taking on the character of Samuel Alabaster, a role that is very different from the endless amount of other characters he has portrayed. Pattinson once again was able to show how much of a prolific, consummate and versatile actor he is in this movie. He made Alabaster a character you can’t help but love. Alabaster had one goal and he did anything and everything to accomplish it. Alabaster is charming, fun-loving, a hopeless romantic and verging on (if not already) delusional in the most comedic way. It’s easy to be fascinated and adore all of the characters in this movie when they are portrayed as extraordinarily as the cast has done in this film. Needless to say, Mia Wasikowska left everyone in awe with her role of Penelope. She’s the ultimate feminist who doesn’t need anyone to save her. Her character is admirable and everyone will enjoy seeing her strength on the big screen. Another scene-stealer in the film is Parson Henry played by none other than director David Zellner. Parson Henry definitely has to be a fan-favorite character in this movie as he is just there for the ride (and his money that Alabaster offered him to officiate the wedding) but he ends up getting into a whole predicament that he has no idea how it started. The Zellner brothers are truly geniuses and not only can they direct in an amazing way, but they can also act incredibly too! Another special character in the movie is the absolutely adorable Butterscotch, a miniature horse who is hard not to gush over. It was a marvelous night in Hollywood as the cast and many other celebrities came out to celebrate the premiere of Damsel on June 13, 2018 at the Arclight Cinemas in Hollywood, California. Robert Pattinson, Mia Wasikowska, Robert Forster and many others had a sensational time attending the premiere and seeing this outstanding movie on the big screen. Everyone enjoyed the remarkable film and its breathtakingly beautiful cinematography. A fantastic after-party took place at the AVENUE following the movie premiere. I, Alexisjoyvipaccess had the greatest honor of attending the premiere of Damsel and I can’t say this enough — YOU NEED TO WATCH THIS FILM! It was so wonderful attending this premiere of a movie with a phenomenal storyline and one of the most stellar casts a film can have. Check out some more pictures below from the premiere of Damsel and be sure to follow @DamselMovie on Twitter and Instagram. Damsel makes its way on over to theaters on June 22nd! Previous VIPAccessEXCLUSIVE: What Is Inside Luxor Box’s May Subscription Box? Find Out In This Unboxing Video Here! Next Article: Brooke Lewis Looked Breathtakingly Beautiful At The Women In Film’s Crystal & Lucy Awards!